You get a lot of benefits from eating the rambutan fruit. But before we get to these rambutan benefits, here's a bit of information about the fruit. The rambutan is a tropical fruit that is believed to be a native of Indonesia and Malaysia. It is believed that the rambutan originated in the jungles of Malaysia and Indonesia where tribal people cultivated the trees around their settlements and villages. From the jungles of these two countries, the trees then spread to neighboring countries like Vietnam, Thailand, the Philippines and other Southeast Asian nations. 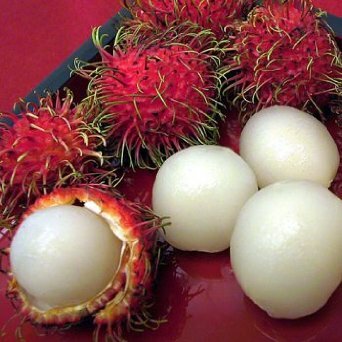 The name of the fruit comes from the Indonesian/Malay word “rambutan” which basically means “hairy”. “Rambut” means hair and if you add the suffice -an, you get “rambutan”. The rambutan belongs to a group of closely related tropical fruits that include the lychee, mamoncillo and longan. People who are not too familiar with all of these fruits often confuse the fruits with each other. 1. It's a healthy snack food. Instead of going for processed foods as snacks, why not eat rambutans. Because of its sweet taste, the rambutan is a popular dessert in Southeast Asian countries. This can be very beneficial if you're suffering from some types of illnesses like diabetes. With rambutan, you can eat something sweet without putting your health in danger. 2. Researchers from the Chiang Mai University in Thailand have reportedly found out that the rambutan fruit possesses antioxidants that they believe help in reducing cholesterol in the body. The same antioxidants are also believed to have cancer-battling characteristics as well as anti-inflammatory attributes. If these claims are true, then eating a rambutan fruit will not only give you well-needed nutrients and vitamins, it will boost your immune system as well. Furthermore, since the fruit is believed to be effective in reducing cholesterol, then eating it is another way of burning and losing fat. 3. The rambutan fruit is rich in Vitamin C. Vitamin C is a very important vitamin that the human body badly needs. If you are not getting enough of this vitamin, your body's defense against certain illnesses will go down. 4. The rambutan also contains amounts of copper and manganese. Copper is a significant player in the creation of new red and white blood cells in the body while manganese is needed by the body in the production and activation of certain enzymes. 5. Phosphorus and iron are also found in the rambutan fruit. The human body needs these in order to function well. These are just some of the rambutan benefits. There are countless others. Also, it pays to mention that the fruit is also being used by some for therapeutic reasons. However, not much is known whether these are actually effective or if there's evidence supporting them so we haven't included them here. That said, the next time you visit a fruit market, look for rambutans. They are not only tasty, they have lots of nutritional benefits as well.